So I did this late last year. While traffic was very stable, the code was old and patched together with twine. It was ugly, hard to manage and couldn’t parse feeds very well anymore. It was time and I think 99% of people understood. We get our news from Twitter and Facebook these days. 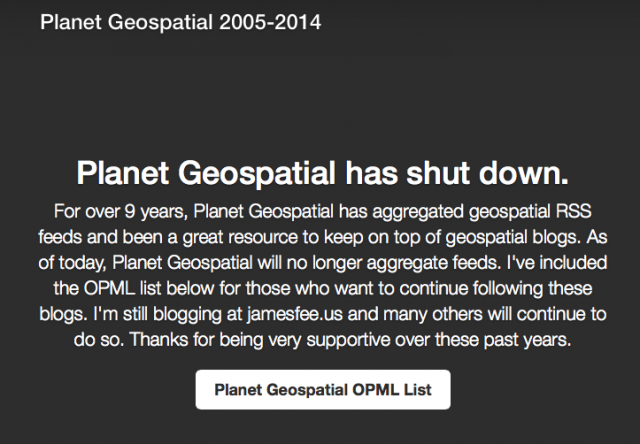 I gave a link to the Planet Geospatial OPML List and let everyone download it and use it with their own RSS reader. But the list itself is old, most blogs are dead and hasn’t been updated in over a year. I’d like to change that. So I’m setting up a GitHub repository where we can collaboratively update Spatial IT RSS feeds and use them however we wish. But before I do that, I’d like to clean up the OPML. I thought about just uploading it and letting everyone hack at it but it’s so out of date I’d like to make a pass at it first. What I need though is your help. If everyone who reads Spatial IT/GIS blogs can forward me their top 5 (you can do more or less of course) blogs I’ll grab the RSS feeds from them and create an updated OPML list that everyone can use on GitHub. Just reply to this email and send me your top blogs. I’ll update everyone on the process next week!